The investigations at 2 Delaware postal facilities come amid a series of reports of suspicious devices sent to prominent Democrats. Several high-level Democrats have been the targets of packaged bombs sent to their addresses, and former Vice President Joe Biden is the most recent victim. Not one, but two bombs were addressed to Biden. Neither detonated and nobody was harmed. Two suspicious packages addressed to former Vice President Joe Biden were intercepted Thursday at two Delaware postal facilities. One package was found at a postal facility in New Castle and another at a Wilmington post office. Both packages are similar to others sent to prominent national Democrats in recent days, the FBI says. Federal and local investigators swarmed two Delaware postal facilities Thursday morning after the FBI says two suspicious packages addressed to former Vice President Joe Biden were intercepted. Both packages are similar to others sent to prominent national Democrats in recent days, law enforcement officials told NBC News. The first package was found at the Hares Corner postal facility, and reported to police around 5:50 a.m., officials said. Investigators from the FBI, U.S. Postal Inspection Service, Delaware State Police and New Castle County police could be seen around daybreak at the United States Postal Service facility along Quigley Boulevard in New Castle, Delaware. 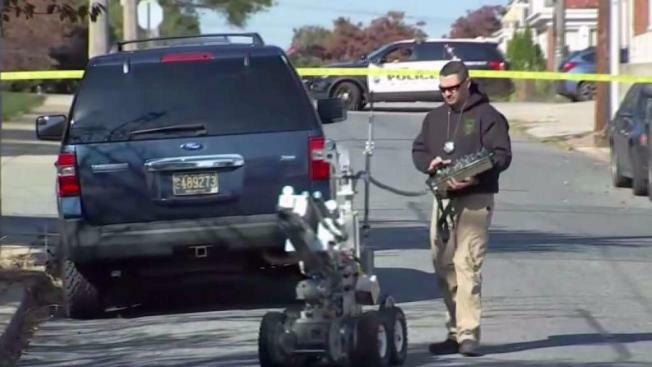 The bomb squad deployed a robot as they investigated. Two separate bomb squads came and went before the scene was cleared Thursday morning. Normal business at the post office in front of the facility continued throughout the incident. The second suspicious package, also addressed to the former vice president was then found a short time later at the Lancaster Avenue post office in Wilmington, which is about 8 miles away, law enforcement officials said. Wilmington Police closed a street behind the post office as they investigated. The bomb squad could be seen leaving the Wilmington scene just before 10 a.m. but K-9 units remained on the scene as postal workers waited to return to the building. The all clear was given and workers returned to the building shortly before 11 a.m.
Federal authorities had been looking into the possibility of a possible explosive device addressed to Biden. His Delaware residence was swept Wednesday but nothing was found. Biden, a potential 2020 presidential candidate and critic of President Donald Trump, said last week that the president may not "know what he's doing" and coddles dictators. The new developments in Delaware came as a device was removed from a lower Manhattan property belonging to actor and Trump critic Robert De Niro. Others were mailed to offices and homes of prominent Democrats and public figures, including one sent to CNN offices in New York City. Packages addressed to Hillary Clinton, former President Barack Obama, billionaire George Soros, ex-Attorney General Eric Holder, former CIA Director John Brennan and Rep. Maxine Waters of California -- who was sent two -- all appear to have the same characteristics, authorities and law enforcement officials with direct knowledge of the matter told NBC News. Some of the 10 suspected mail bombs addressed to high-profile Democrats and others over the last few days were flawed and not capable of exploding, while others have yet to be fully analyzed, several investigators said Thursday. Multiple officials briefed on the investigation said there were no solid leads on a suspect as of Thursday afternoon. The Delaware response came the morning after a suspicious package was found near the Montgomery County, Pennsylvania, office of Republican State Rep. Tom Murt. A bomb disposal unit was called in and the package was determined to not be explosive. The FBI is asking for the public's assistance as they investigate the suspected devices. Call 1-800-CALLFBI (225-5324) or use http://tips.fbi.gov if you observe suspicious activity, the FBI said in a tweet.